A corpus of Rs 12,000 crore has been allotted towards speeding the construction of seven metro lines, Mumbai-Trans Harbour Link (MTHL) Road and the monorail. Other major projects include construction of flyovers, creek bridges and road network. Tightening of noose around errant builders, clearing 900 complaints and establishing an appellate tribunal under RERA highlight the State’s commitment to bring transparency and accountability in the real estate sector. This will also address the trust deficit among consumers and bring back the growth momentum. The Ministry of State Housing Development has proposed to hand over redevelopment of slums and MHADA buildings to Maharashtra Real Estate Regulatory Authority (MahaRERA). The authority will supervise and ensure that the norms under Slum Rehabilitation Authority (SRA) are not violated. The commencement of the long-pending Navi Mumbai International Airport near Ulwe in Panvel is set to overhaul the realty landscape of the city. This airport is touted to pave way for several new road projects such as widening of the Aamra Marg and NH-4B. Setting up of a 21-member Maharashtra State Wetland Authority (MSWA) will ensure protection of 115 wetlands across the State. New rules under the policy will prohibit activities such as conversion of wetland for non-wetland purpose, disposal of waste, construction, and discharge of effluents from units. After a lackluster performance in 2017, Mumbai’s realty exhibited signs of a revival in the first quarter of 2018. Stakeholders regained foot and came to terms with the ambiguities prevalent in MahaRERA and Goods and Services Tax (GST) norms. While developers returned with new launches, buyers reciprocated with increased enquiries and absorption in select areas of the city. The awaited reduction of Ready Reckoner Rates (RRR) kept buyer sentiment optimistic throughout the quarter, however, constricted property registrations until the final announcement on April 1, 2018. Infrastructural development held the baton to city’s realty fortunes as several projects such as Mumbai Trans-Harbour Link (MTHL), Mulund-Goregaon link road and Dahisar East to Andheri metro stations were fast-tracked. MahaRERA played a major role in luring long-time fence-sitters back to the property market. Formation of an appellate tribunal, stringent penalties on developers delaying projects, creation of member forums for resolving builder-buyer conflicts were some of the measures which elicited increased confidence amongst the otherwise wary homebuyers. The inauguration of the Navi Mumbai international airport augured well for residential demand in the zone. Not surprisingly, localities close to the airport topped the popularity charts in Navi Mumbai this quarter. Thane, on the other hand, remained popular for properties priced within Rs 70 lakh. 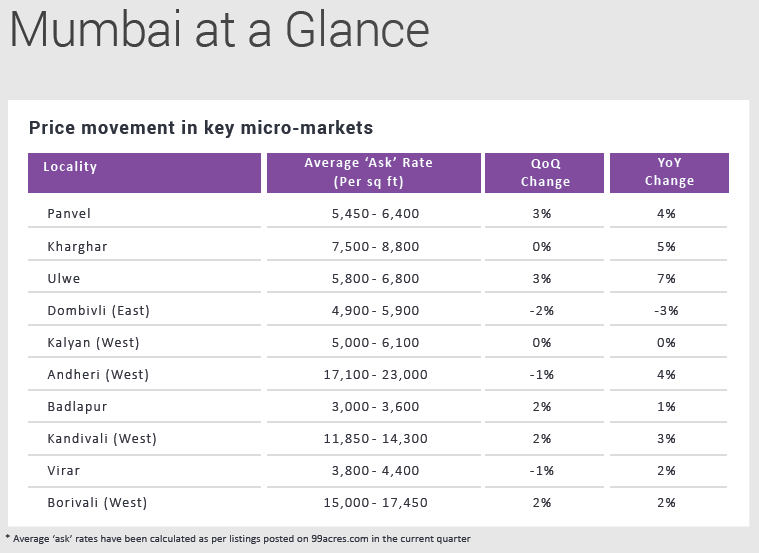 Ambitious metro plans for Thane contributed to a spike in average weighted capital prices and improved the attractiveness index of the sub-city. Significant infrastructure overhauls, pro-growth policies and fast-paced progress towards efficient implementation of MahaRERA have already started realigning Mumbai’s realty market. The cumulative impact of all these is anticipated to reap noticeable returns in the ensuing quarters. While 2017 saw Mumbai grappling with a housing crisis post the implementation of reformatory policies such as RERA and GST, the first quarter of 2018 kick-started on a positive note. Marked by an increase in new launches and better absorption, the real estate sector continued to align itself with the transparent guidelines and buyer-focussed approach impelled by RERA. The city witnessed both primary and resale markets quickly gaining ground among the homebuyer community with GST hardly playing a spoiler anymore for the under-construction segment. Evident signs of a revival surfaced in the final quarter of FY 2017-18, as buyers regained confidence in light of improved economics. A marginal increase in average capital prices in Jan-Mar 2018 foretells the dawn of a progressive real estate sector in the upcoming quarters. North Mumbai locales featured at the top of popularity charts as the region stood at the center of major infrastructure developments such as Mumbai Trans-Harbour Link (MTHL), Mulund-Goregaon link road, Colaba-Seepz metro and Dahisar East to Andheri metro, among others. Remaining at the focal point of expansion, Malad (East) and Bhandup (West) led the capital charts in Jan-Mar 2018, recording a four percent and three percent increment, respectively. Malad has gained popularity in the ‘compact homes’ segment, offering affordable inventory within the city. Kandivali (West) followed suit with a three percent rise in property prices as reputed developers such as Ruparel Realty and Godrej Properties set their footprints in the locality and launched affordable and luxury residences in the same project. The two percent annual growth in rental prices resulted from ambitious working professionals seeking to upgrade their lifestyle. The penchant to improve their social position was catered by the posh addresses developed by renowned developers. Powai, home to Hiranandani Gardens, reported an eight percent increase in rental prices, YoY. Some of the townships situated in Powai redefine Mumbai’s real estate and offer world-class amenities that allure the white-collar professionals of the millennium city. Presence of corporate offices in Andheri, sound connectivity via metro, proximity to international airport and rapid residential growth has led many tenants to settle in both western and eastern parts of the locality. While Andheri (West) clocked a four percent hike, Andheri (East) came a close third with a five percent YoY increment in rental prices. The groundbreaking launch ceremony of Navi Mumbai International Airport lifted the clouds of doubt surrounding the growth potential of this major suburban node of Mumbai. In Q1 2018, Navi Mumbai chronicled an increased number of enquiries, with maximum localities displaying an upward capital price movement, QoQ. For the last many quarters, Navi Mumbai was reeling under slow deployment of touted infrastructure plans such as international airport, MTHL, and Uran-Seawood local railway. Initiation of these projects spread cheer amongst the stakeholders and realigned the market on growth track. Further, MahaRERA helped buyers regain the lost confidence in the realty market, as accountability of developers and control of a regularity authority protected the homebuyer community. Maximum project launches in Navi Mumbai were recorded in Kharghar, Ulwe and Panvel in Jan-Mar 2018. Affordable housing destinations such as Panvel and Taloja are fast catching pace in light of the incentives offered by the Government to accomplish ‘Housing for All’ mission. Panvel saw a three percent increment in capital prices, while Taloja recorded a two percent downtrend, QoQ. Jogeshwari–Vikhroli Link Road (JVLR)-Koparkhairane- Ghansoli bridge planned by MMRDA has spiked investor and end-user interest in Koperkhairane, leading the locality to witness a two percent increment in capital prices, QoQ. Vashi and Airoli also featured among the best performing pockets in Navi Mumbai with a two and one percent rise in capital values, QoQ, respectively. The rental market of Navi Mumbai continued to tread a growth trajectory, recording a four percent hike in average weighted prices, YoY. Rapid infrastructure development, connectivity links and the presence of competitively priced properties fueled demand and hence, prices in localities situated close to Navi Mumbai international airport witnessed an upsurge. In line with the previous quarter, Ulwe featured at the top of the rental graph, with a seven percent increment, YoY. Kharghar, on the other hand, boasts of housing affordable properties as compared to the established markets of Navi Mumbai. Connectivity to prime office areas in Belapur central business district (CBD), and access to Mumbai and Pune triggered a seven percent hike in rental values, YoY. Shedding its erstwhile industrial and regressive image, Thane has now transformed into a coveted suburb of Mumbai. Thane’s selection as a smart city, ahead of metro cities such as Bangalore and Trivandrum, highlights the Government’s focus on developing the metropolis into a global investment destination. The latest announcement of kick starting cluster redevelopments in the next six months promises creation of vast open spaces, construction of wider roads and tree-lined walkways in the future. Thane has a competitive edge over its counterparts - Mumbai and Navi Mumbai, given its excellent infrastructure, commercial expansion and availability of huge land parcels. In 2017, Thane was home to 18 percent of the new residential launches in Mumbai. Migrant working population is hugely responsible for the city’s growth as a metropolis. Bhiwandi, famous for its textile loom industry, has emerged into a warehousing hub. Recording a five percent QoQ capital upsurge, the pocket benefitted from the massive growth in warehousing leasing space in 2017. The emergence of ecommerce, FMCG and manufacturing companies in the warehousing space coupled with the commencement of Bhiwandi-Kalyan metro line construction also played a growth driver. Following suit, Ambernath and Badlapur ruled the roost in budget housing segment with ample availability of units priced within Rs 40 lakh. The belts attract working professionals scouting for homes close to Bhiwandi. While Ambernath recorded a three percent QoQ spike in values, Badlapur closed the quarter with a two percent increment. Another stretch that catapulted Thane’s housing market to the next level is Kalyan-Dombivli belt. Construction work of the proposed Kalyan-Shil-Taloja metro is set to commence in April 2018, spiking residential demand in neighbouring localities. Thane’s rental market has thrived since the arrival of MMR’s largest commercial campus by Tata Consultancy Services (TCS) in Hiranandani Estate in the year 2016. Further, the proposed Wadala-Thane- Kasarvadavali metro IV corridor has been instrumental in boosting the connectivity quotient of this popular suburb of Mumbai. Green signal to Thane-Bhiwandi-Kalyan Metro V corridor has contributed to the four percent hike in rental prices of Kalyan (West), YoY. Majiwada, which has become a hot favourite among the tenant community looking for good schools, premium malls and sound healthcare amenities, posted a two percent upsurge in rental values, YoY. Other popular localities that topped the rental charts include Dombivli (East), Badlapur and Ambernath. A reverse trend was observed in the demand-supply equation in Jan-Mar 2018 as compared to Oct-Dec 2017. While under-construction homes recorded increased popularity, possession-ready homes observed a decline in demand despite being the dominant category. Greater transparency owing to RERA’s implementation contributed to the rising preference for under-construction properties. Of the three zones, Navi Mumbai saw maximum popularity for under-construction homes, up by three percent QoQ, as the commencement of international airport infused renewed confidence among homebuyers. Supply of the category matched demand at 13 percent in Navi Mumbai. 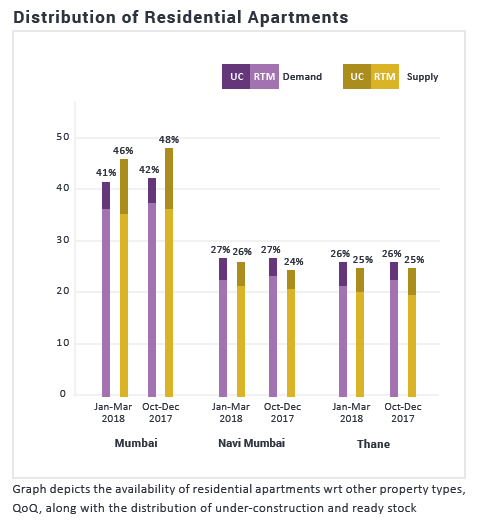 Thane, on the other hand, saw a marginal dip in the availability of under-construction properties despite seeing a two percent improvement in demand for such homes in Jan-Mar 2018. Major factors behind healthy traction from end-users in Thane are infrastructure upgrades resulting in better connectivity and premium construction quality across reputed projects. Both demand and supply of properties priced within Rs 1-2 crore saw a marginal upward revision, hinting the continuing preference for good construction quality projects that come with a premium price tag. Popularity of homes priced between Rs 60 lakh and Rs 1 crore decreased marginally, while availability of units spiked by a percent. Meanwhile, Rs 2 crore and above segment saw a reduction in supply, as no change in demand played a spoiler for this bracket.